We have been without access to the Internet in our room for two weeks now. During most of that time, the hotel office has been without access, too. We couldn’t even use our Skype to call friends and family in the U. S. We have cell phones, but are hesitant to use them in a non-emergency situation because we’re unsure about how much the call recipient will have to pay. So, for two weeks, we’ve been electronically isolated. Well, that’s not exactly true. After the first week or so, we figured out that we could take our computers to the Plaza de Ponchos, site of the famous Otavalo mercado (market), to send and receive email. 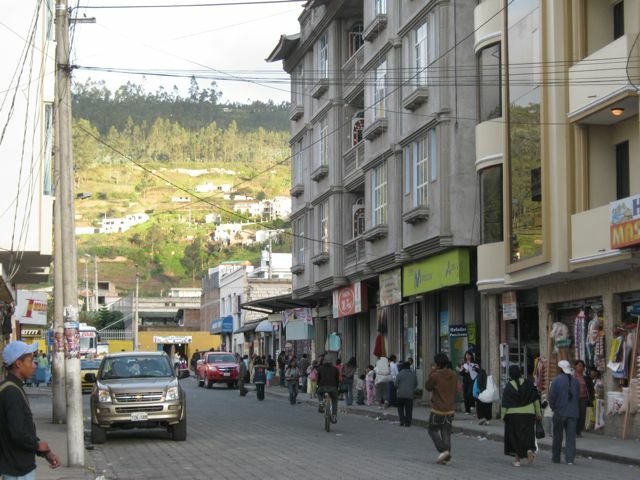 Due to the number of tourists who come, Otavalo decided to install wireless Internet access at the plaza as an amenity. We can handle email there, but we can’t do things much more complicated than that because of the time and inconvenience involved, not to mention concerns about security. For instance, there are several blog posts in various stages of preparation (including this one), but they won’t see the light of day until we once again have convenient access to the Internet. No matter what the claims might be, its tedious to post on Blogspot when pictures with captions are involved. I also like to keep an eye on stocks I own. I can’t do that very well when someone may be looking over my shoulder. I know the stock market is going down right now, but I don’t have a sense of whether it’s time to buy more stock or whether it’s best to sit tight. Reading online newspapers, both English and Spanish, is another favorite activity of mine. I can’t operate the computer myself at the Plaza de Ponchos, and I’m not going to ask Marilyn to spend more time helping me than she already does, so I can’t feed my news junkie addiction with online newspapers, either. No telling what Nancy Pelosi, Sarah Palin, and Hugo Chavez are up to by now. 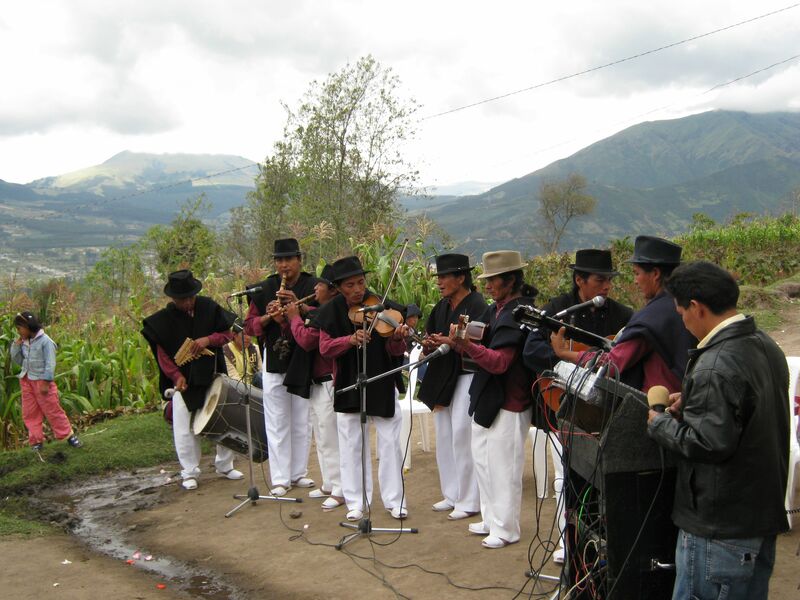 By the way, we’re told that the South American presidents will be meeting in Otavalo June 3rd and 4th. You never know – I just may see Hugo Chavez in the flesh. Of course, there are newspapers here, but turning pages in a newspaper is a pain for me, especially when I have to look up every 3rd or 4th word. This has really driven home to me just how dependent on technology I am. Indeed, I’ve known for many years that my life would be but a faded shadow of what it is currently were it not for technological marvels such as the computer, the lightweight wheelchair, and the DVR. I don’t believe that my will to succeed (which came from my mother and God) would have been enough to get me to this point had it not been for technology. 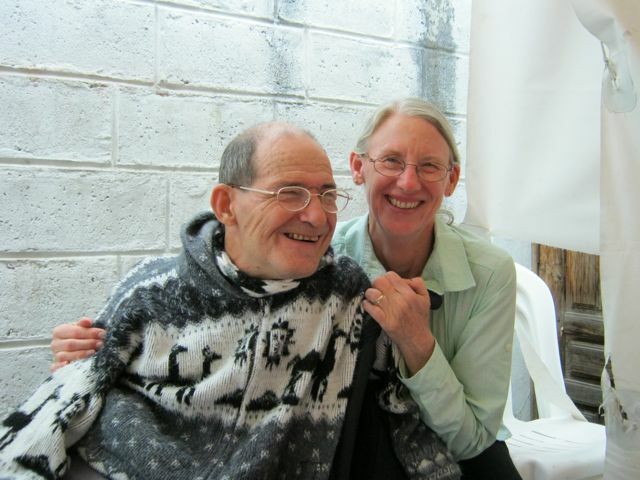 Certainly, the infant not expected to live more than three days after birth would not have had the opportunity to become the 61-year-old missionary’s assistant in Ecuador for a year had it not been for ever-enabling technology. My life has really only been altered in minor ways because part of that technology has been absent for two weeks. I’m still getting around Ecuador (in a car). I’m still able to read books (on an electronic book reader). I’m still able to write (on a computer). I’m still able to call people if the fancy strikes me (on my cell phone). I’m still able to print pictures for friends (on my printer). To be fair to pre-high-tech, there have been some benefits to not having trillions of gigabytes of information at the tip of my head pointer. I’ve been able to read more, often on the veranda where friends as well as strangers stop by to talk even though my Spanish is none to good. (My reading is on a Kindle, which is high-tech, but that’s beside the point.) I’ve been around when the hotel manager was redecorating and been asked my opinion as to locations for decorations – which gave me the satisfaction of helping. I’ve been able to write more, such as this reflection. (Again, ignore the fact that I’m writing on a Macbook Pro.) I’ve watched a soccer game with the hotel staff – riling up half of them by declaring my allegiance to one team, then the other half when I switched allegiances. Last night, a group of us had a great time looking at some photos Marilyn had taken of a trip on which we had all been present. In short, I’m now more in tune with Ecuadorian time. 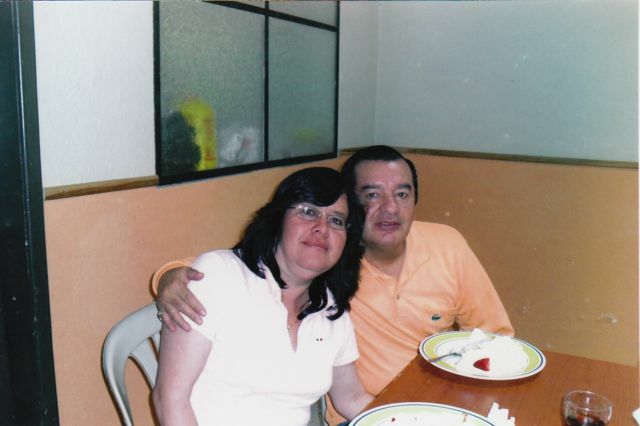 Victor, technical advisor for FEDICE, is supposed to marry Marlene in Quito at 5:30 p.m. today. However, the roads between here and Quito have been closed for three days due to strikes by indigenous groups protesting a new law which would force them to pay for water they currently get free. Victor says the real problem is that indigenous groups are under-represented in the national assembly and feel they didn’t have a proper role in helping to craft the law. We were told by Isabel the highways may open at or shortly after 3:00 p.m., when President Rafael Correa was scheduled to speak with indigenous groups. The assembly had postponed their scheduled vote on ley de agua (the water law) for five or six months. We got in line at 3:00 p.m. First, we waited a while, then we tried to take a road around Lago San Pablo. It was blocked, too. So we got back in line and waited until 4:30 p.m. Marilyn walked to the front of the line and asked a policeman if he had any idea when the highway would open. He said, “Maybe 7:00 p.m.” So we gave up on getting to the wedding of Victor and Marlene in Quito and went home to the hotel. We decided to take a long walk before dinner. When we passed the window of the veterinarian who had taken care of Cuatro, then had to put him down, we stopped and had a long talk. We think the talk was about economics. And we think he seemed to think that President Obama was causing more problems than he was solving. It’s hard to be certain when one’s language skills aren’t very good. On our way home, we saw our friend Viviana, and were invited to an English Festival to hear her son David sing a song at 9:00 a.m. tomorrow. Why not? The roads were closed, we’d already missed Victor and Marlene’s boda, and it didn’t look like we’d be able to make it to Blanca’s cumpleaños (birthday) in Quito tomorrow. As she had the night before, Isabel called to check on us. She’d left work by the time we’d returned to the hotel, so didn’t know if we’d been able to get through to Quito or not. Isabel, along with others here and in FEDICE, tends to keep close tabs on us. It feels good to be cared for so far from home. Don Jairo told us at breakfast that the roads were open so, after David’s performance, we called Blanca to find out what time her Fiesta de Cumpleaños (birthday party) would be held. It was to be at 1:00 p.m., so we had time to make it. 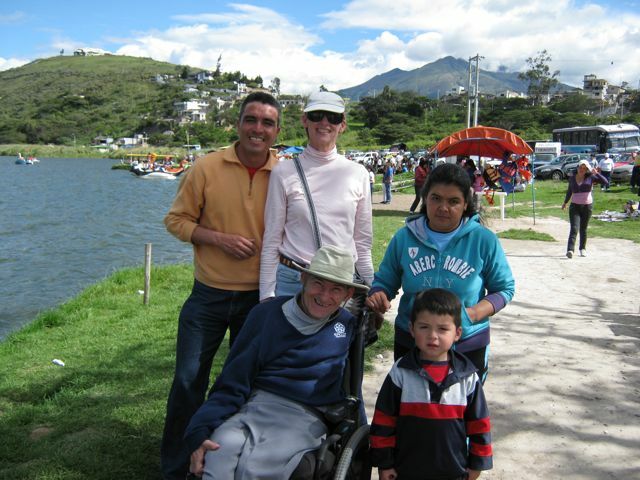 On our drive to Quito, we missed a turn and ended up on a road through Cayambe and Tabucando. It wasn’t the shortest route to Quito, but it was very pretty, with tall eucalyptus trees forming a canopy overhead. We decided we’d take Marilyn’s mom this way when she visits in June. We made it to Victor and Marlene’s house with about 30 minutes to spare. The party was to be held at the FEDICE offices, but we only knew how to get to Victor’s house in Quito. Unfortunately, no one answered the gate or cell phone. Marilyn was on the phone with Luis trying to get directions, when Maria’s husband drove up behind us and opened the gate. 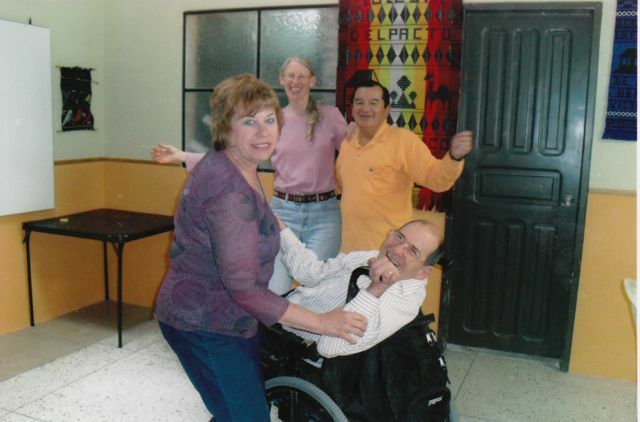 Maria and her husband are caretakers for Victor, and now Marlene. Victor, Marlene, and Maria were home, but hadn’t heard the timbre (bell). I don’t know what the deal was with Victor’s cell phone. Maybe we don’t have the right number. We followed Victor and Marlene to the FEDICE offices and didn’t lose them. At the party, we had pizza, cake, ice cream, and wine for toasting. After eating, we looked at pictures of Victor and Marlene’s boda (wedding) of the night before. Blanca had been wanting to dance with me at the wedding, which we hadn’t been able to attend, so we ended the party with some dancing. All of the FEDICE staff were at the party. 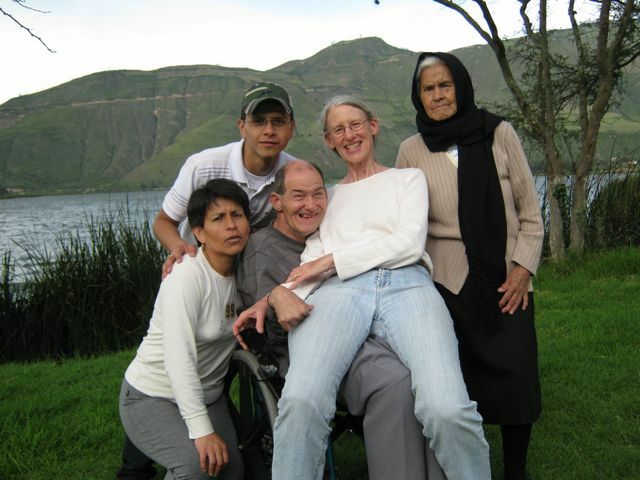 Marlene and Victor kept asking us to stay with them in Quito that night, even though we didn’t have so much as a toothbrush with us. We finally accepted their gracious invitation. After that was decided, we, Blanca, y Luis decided to go to the Panecillo. We want to take Marilyn’s mom there when she visits in June, so we need to know how to get there. On the way, we dropped Marlena, a staff member of FEDICE, off near her home. 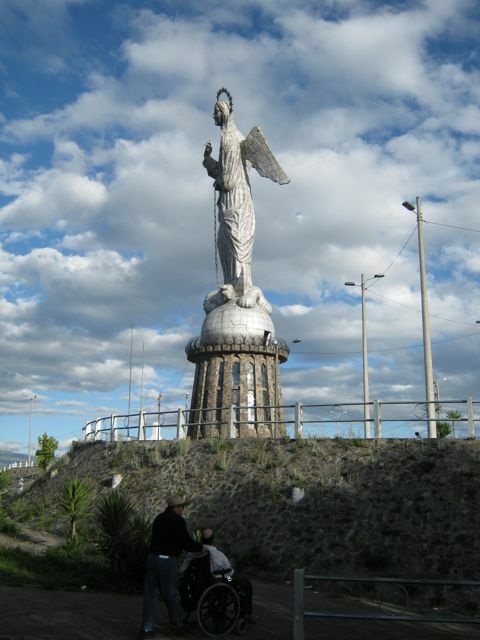 It was a great day for a visit to the Panecillo, as it was not cold or windy or cloudy. We had cotton candy, something I haven’t done for years. 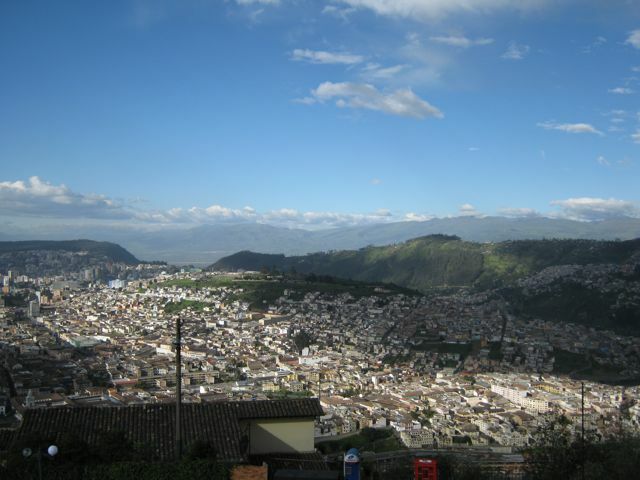 The views of Quito and its surrounding mountains were simply spectacular. 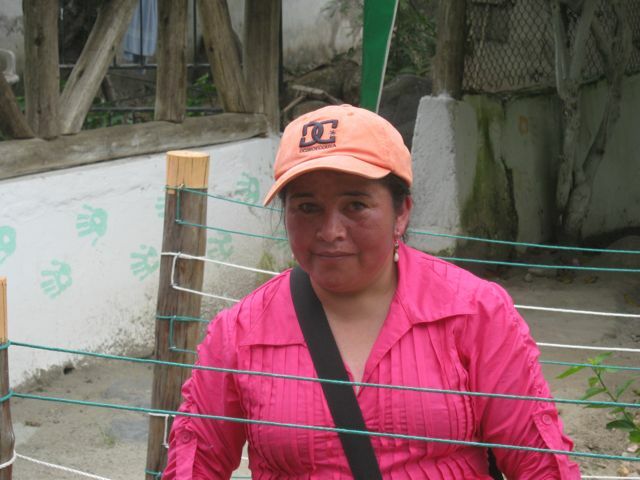 Since we were now near south Quito, where Blanca lives, we offered to take her home. We ended up letting her out about a 4-6 minute walk from her home. Luis then directed us to the airport entrance, so we’d know how to get there in the future, before we let him out about seven blocks from his house. He told us he used to have a nice car, but it was stolen and never recovered. Following Luis’s directions, we found Victor and Marlene’s casa with only one wrong turn. They fed us a cena (dinner) of soup and bread, we watched the news together, and then went to bed. Marlene was so thoughtful. She put pajamas, toothbrushes, toothpaste, and bottled water in our room. I really admire Marlene. She came to marry a man in a country where she doesn’t speak the language yet. Though she’s been here two or three times in the past year, she’s only been here a month this time. One of the factors in deciding to spend the night was that I figured she could use some good old North American English-speaking company. Marilyn started sniffing in the night but didn’t get really sick. She did feel pretty rotten on the drive home, though. We assume it’s a cold or allergies. The breakfast with Victor and Marlene was really good. Maria made an omelet of her own invention, mostly vegetables but also a little ham. I had thought we might try to find the FEDICE office on our own before leaving Quito, but Marilyn was not feeling up to par, so I didn’t pursue it. I think we’ve got it down anyhow – five lights south on the Pan American highway from Victor’s, a right on Bellavista, and a left on a street ending in Molles just before Bellavista curves to the left. Yeah, I got it. 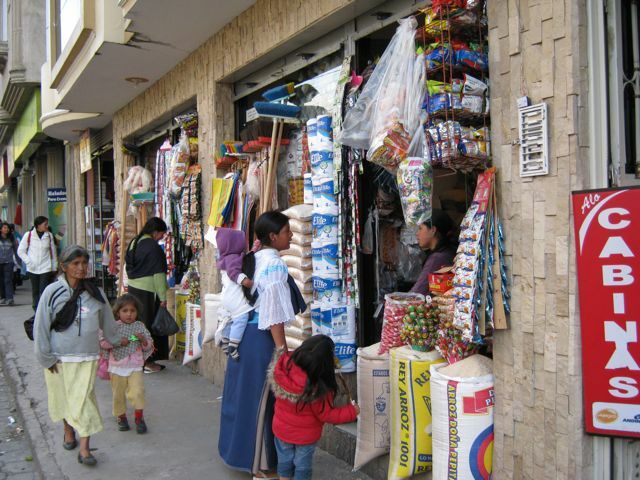 We did stop at the SuperMaxi to pick up things we hadn’t been able to find in Otavalo, like facial tissues, Q-tips, and calcium tablets. Then we went on home, taking the pretty road back again. People were glad to see us back at the hotel, especially Isabel. Don Jairo, manager of the hotel, rented a bus and took all staff wanting to go (except for one gardener who watched the hotel), plus us, on a trip to his and his wife Yolanda’s finca (farm) and to some hot springs. We were to be ready to board the bus at 6:00 a.m. Marilyn was certainly glad that she didn’t have to drive, since she was still tired from our previous two days activities and suffering from what we hoped was allergies. 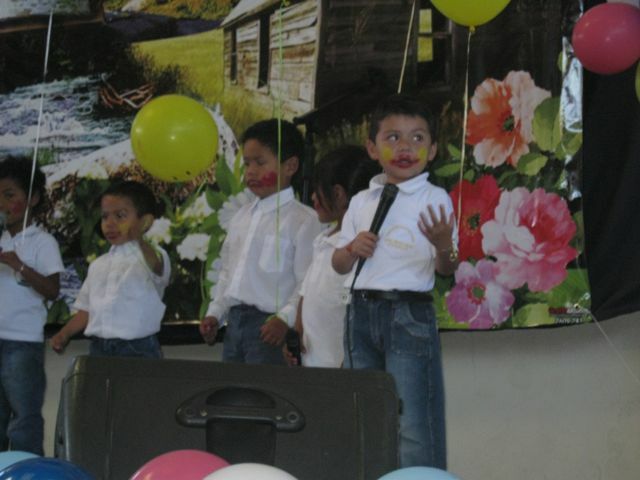 On May 1st, Ecuador celebrated Día de Trabajadora (Labor Day), but all of the hotel staff, plus some temporary help, had to work that day because a company held an all-day Fiesta here for their employees. I’m sure this was Don Jairo’s way of rewarding his staff. 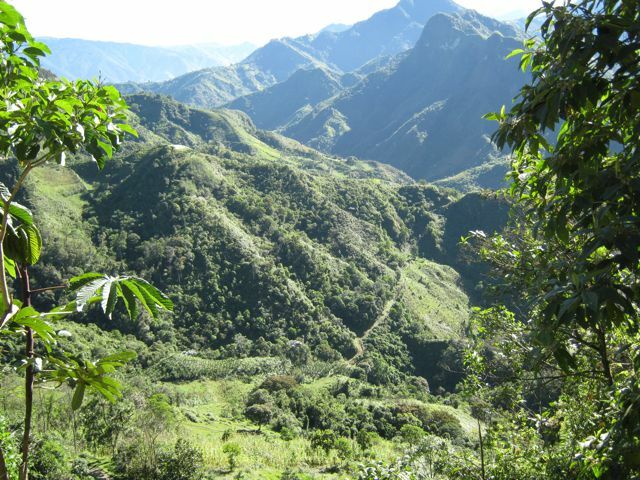 And, as far back as when he had helped us look for a car and learned that I liked mountain roads, he had mentioned taking us to the finca some time. We were eager to go. We started on a road that Marilyn and I had actually taken while exploring one day, but went way past where we had thought it best to turn around. Not far past that spot, we came upon a really nice asphalt highway and turned left. It turned into a dirt road high in the mountains, but was still graded nicely. Later, we saw a very large mine for cement-making materials (near the finca) and understood why it was such a nice road. The day was glorious and we had some great views of volcáns Imbabura, Cotacachi, Cayambe, Chimborazo, and, I believe, Cotapaxi. 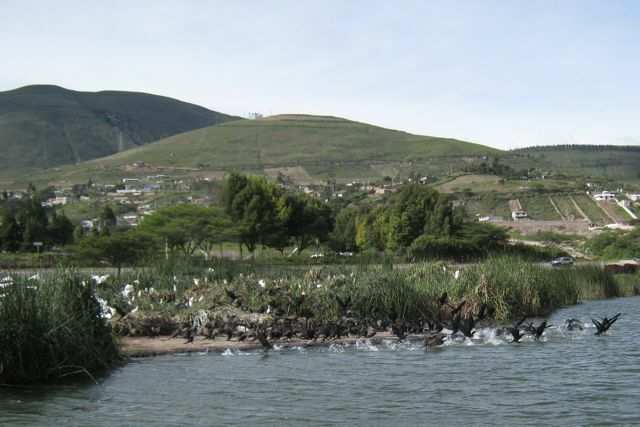 We could also see the Pichincha Mountains that line one side of Quito (the west side). We also saw pericos (parakeets) and a conejo (rabbit), as well as many pretty ferns, plants, and wildflowers, some of which looked like lupines or bluebonnets, and Indian Paintbrush. We stopped several times before getting to the hot springs at Nangulvi. The first stop was just a bathroom break in the bushes, but the second was Jairo and Yolanda’s finca. The finca has been passed down to them through family. We were high on the side of a mountain and were told the finca encompassed all the land we could see below. It was very large. (This turned out to be a slight exaggeration, but it was still more than half of what was below us.) There were not very many level places, yet there were patches of crops all over the mountainsides. Not only here, but in other places in Ecuador, I’ve seen crops on slopes that had to be greater than 45 degrees. How they’re tilled, planted, tended, and harvested must be a sight to behold. Two families live on the farm, caring for it. I suppose it’s a form of sharecropping. We stopped at the house of one family and talked to them. Jairo especially talked. He was probably getting a report of sorts. There were also vacas, caballos, and pollos there to admire. Several of our party milked a vaca, so we could drink some warm, fresh milk if we wanted. It was delicious. 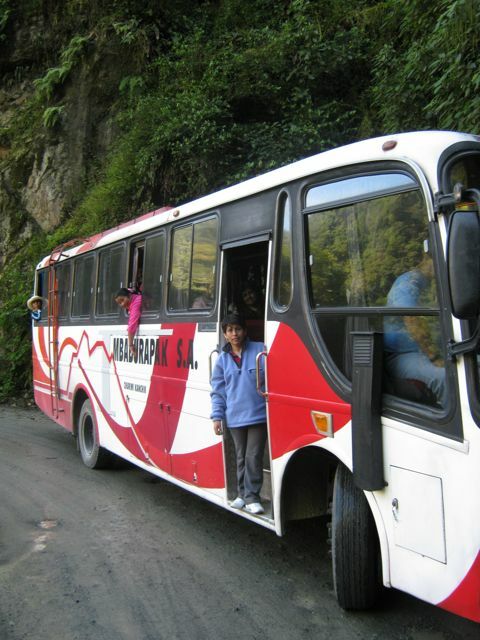 Not far past the finca, we came upon a gorgeous cascada (waterfall) and the bus stopped amid cries of “Foto! 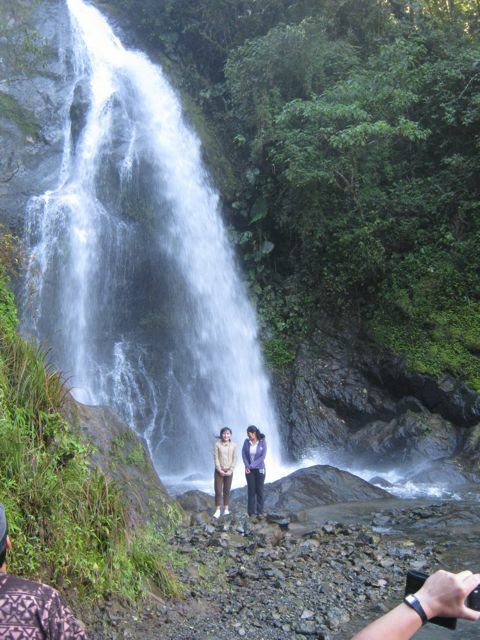 Foto!” We had passed a couple of cascadas already, but nothing like this. Part of the cascada’s pool covered the road with four to six inches of water. When everyone was back in the bus, we gingerly crept through the pool, with the cliff of the mountain being two to four feet away. I couldn't help thinking about how running water can sweep a car away around Austin. I was definitely having my adventurous side nourished. Of course, we were on a big ol' bus. We then went to our desayuno (breakfast) stop. It was the Hospederia de Intag. A hospederia is a lodging place. The hotel employees had prepared fixings for sandwiches, which is what we ate for breakfast. There was also coffee, tea, and (for those who don’t like either of those choices) cola. Following desayuno, we all walked about 200 yards to the piscinas (swimming pools). 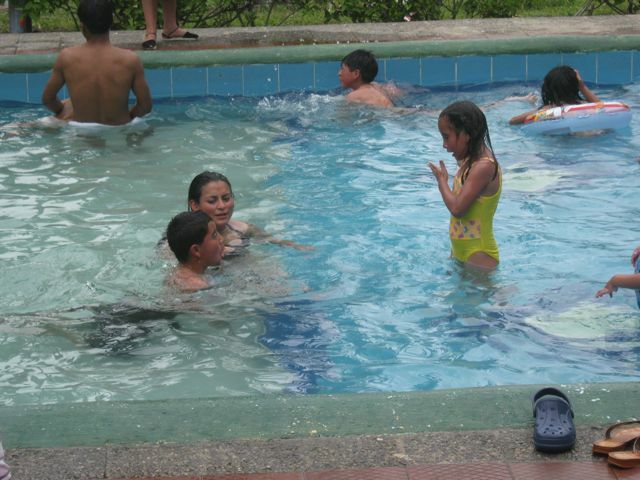 The one closest to the bath house was the second largest piscina there, so we happily piled into it after changing into our swim wear. (Also, the largest pool was agua fria (cold water) instead of agua caliente, and no one wanted that just yet.) I made the mistake of floating on my back for about an hour, with no sunscreen on my belly, in bright sunshine, at about 9,000 ft. Oh, did I pay in the coming days! 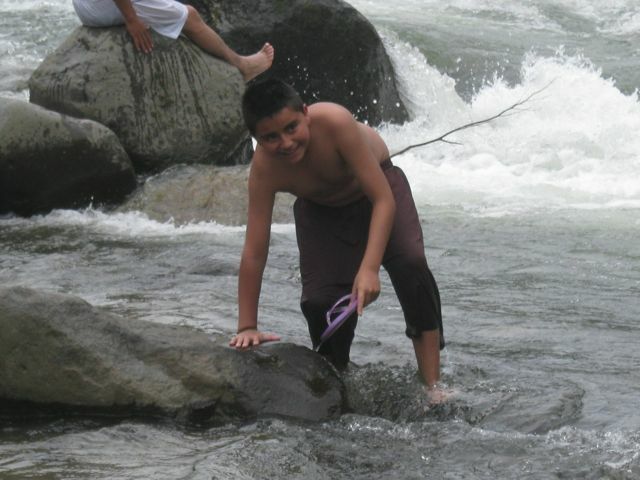 There was a beautiful river almost right beside the piscinas. 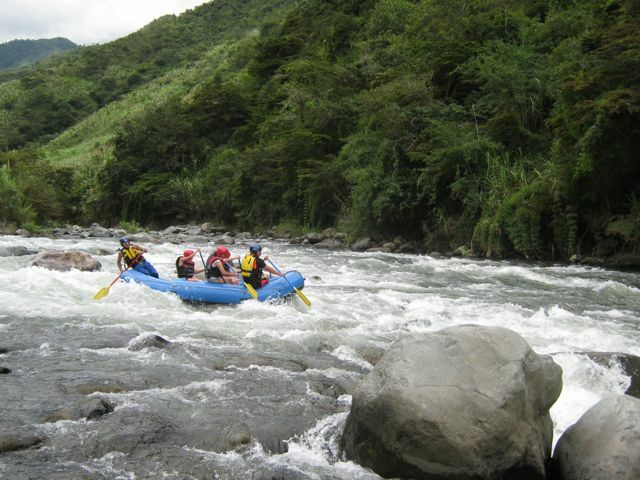 Its frothy waters tumbled over the smoothness of wear-worn boulders and smaller rocks, creating a perfect environment for river rafting. That’s exactly what some of the group did, with a one-raft company located near the piscinas. They started about a kilometer upriver, while we stayed in the “landing zone”, so to speak, getting some good pictures before and after they beached their raft near us. After almuerzo, I was reminded of Christmas get-togethers with Marilyn’s family because many of us walked down the quiet country road running in front of the restaurant. We passed a farm growing caña azucar (sugar cane) and a few of us wanted to buy some, so we pounded on the gate until the señora came out. She agreed to sell us some, and she and her husband led Marilyn and others up into the fields. 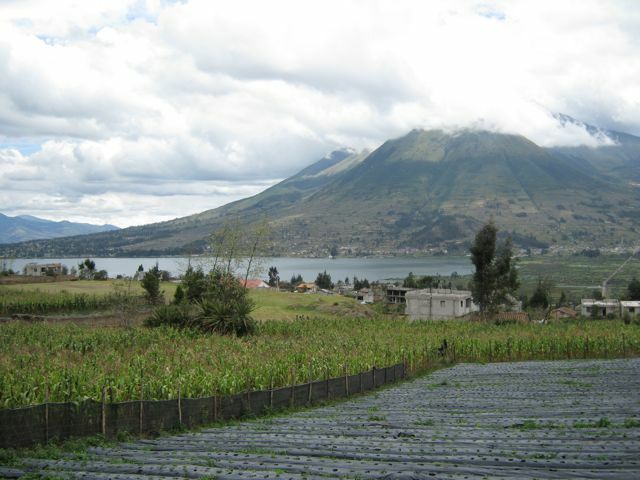 Agricultural fields are rarely flat in the Andes of Ecuador! 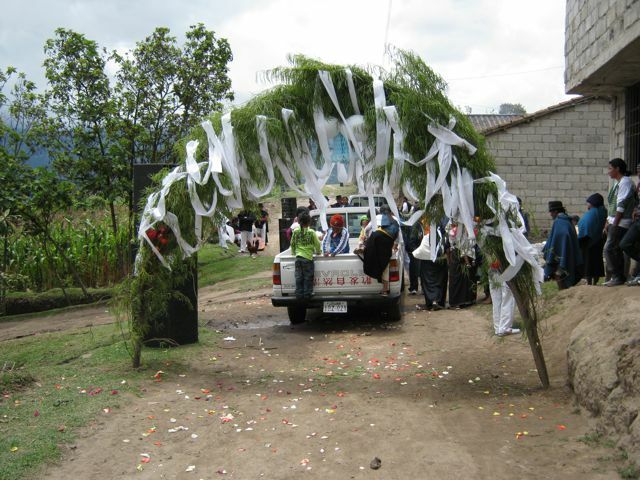 They came back toting stalks of caña azucar and bags of yuca (yucca). The yuca is interesting. The plants are kind of like short trees with branches that end in seven leaves. After eight months, they’re ready to be harvested by pulling them up out of the ground. When they’re pulled up, the tuberous roots come with them. You eat the roots. They taste kind of like papas (potatoes), only more fibrous. Walking back to the bus, Isabel had the easiest job (I think) pushing me. Everyone else was either carrying stalks of caña azucar or hauling one sack of yuca between two people. We went home a different way than we had come. It was shorter, but the roads were not nearly as good, so it took about the same amount of time – three hours. We stopped in the small pueblo of Apuela for a refreshment and potty break. Marilyn was talking to a man in the town square and mentioned how beautiful the pueblo was. (It really was beautiful, too, set high in the rugged Andes.) The man replied, “It’s not beautiful here. The people are very, very poor.” It’s a cliché, but once again we were reminded that beauty is in the eye of the beholder. Leaving Apuela, we continued upward and reached the clouds of the cloud forest. It was late in the day. At times, the clouds (fog, actually) were so dense, I’m not sure how the bus driver could see the road. I know I couldn’t see it, and I was only five or six feet behind him. But, then, I could see out the sides, so we assumed his closer proximity to the windshield gave him a similar viewing advantage. I could also look through the bus door windows, all the way down to the ground, and saw how close we were to sheer precipices. Others saw it, too, and squealed. Finally, a pickup passed us. Being able to follow the tail lights made things easier, though the thought did occur to me that we could easily follow those tail lights off a cliff. I hope Jairo gave that bus driver a large propina (tip), because he definitely earned it. We got home about 8:00 p.m., after being ready to board the bus at 6:00 a.m. It had been a long but very enjoyable day. Marilyn and I felt so thankful and honored that Don Jairo, Yolanda, and the rest of the hotel staff wanted us to share their Día de Libre (day off) with them. They could have easily told us that the hotel would be closed that day and we’d need to find another place to eat. It would have been perfectly understandable. So it must be true when we hear that we’ve become part of the “hotel family”. 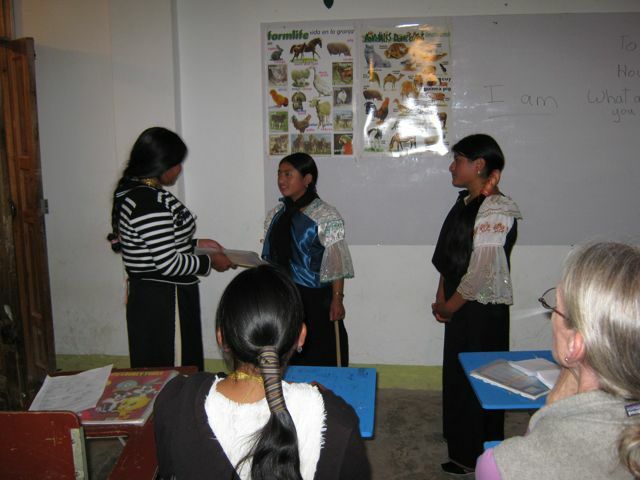 Today begins my fourth week of teaching English in Huaycopungo. I am grateful that there is no pay involved, because teaching an academic subject is not really my forté. I do my best, but if my effort lacks ability, being fired won’t affect my income, only my pride. Fortunately, I have received good feedback from Blanca, Executive Director of FEDICE, who has visited one day each week to keep tabs on how things are going. It is good to know that FEDICE checks on all of their programs with frequency. My classroom is on the bottom floor, at the end of a long hall underneath the worship area of the community’s Evangelical Church. Since the children in the after school program often play ball in the hall, it is not surprising that the window above my door is missing. That missing window allows the noise from the hall total access to my classroom. In spite of the intermittent noise distractions, my students are relatively attentive. The 3:00-4:00 o’clock class is composed of 12-13 year olds (although for some reason, one of the students is 15 years old, and another is 10 years old). During the first week of class, they were asked to raise their hands if they had studied English in school. Absolutely no hands went up. Yet, many of them already knew some of the material presented, like numbers and the alphabet. From what I’ve heard from others, all students study English, but emphasis is more on writing than speaking. And my accent is much different than the English they are hearing from their teachers, whose native language is Spanish. The 4:15-5:15 o’clock class is composed of 13-16 year olds on the whole. Their attention is harder to hold and this class's knowledge seems to range from very little English to a whole lot of English. The good thing is that the students are returning to class, so that tells me that the class isn’t too boring, or else they really like to be with their friends. I am hoping it is the former. I teach these two classes on Mondays, Tuesdays, and Thursdays. The two big market days are Wednesdays and Saturdays. I am trying to make the class fun. 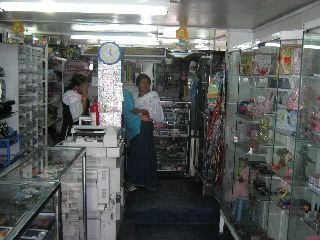 They practice their English with partners and in small groups. They once performed skits in English that they made up themselves. I try to include fun songs that they sing in every class. They’ve competed in small groups spelling vocabulary words on the board (that was a big hit). And then, there is the rote repeating to get their pronunciation closer to how I speak. Also, I sometimes include a verse from the Bible in English. So I suppose they can expect that the class will be different each time. 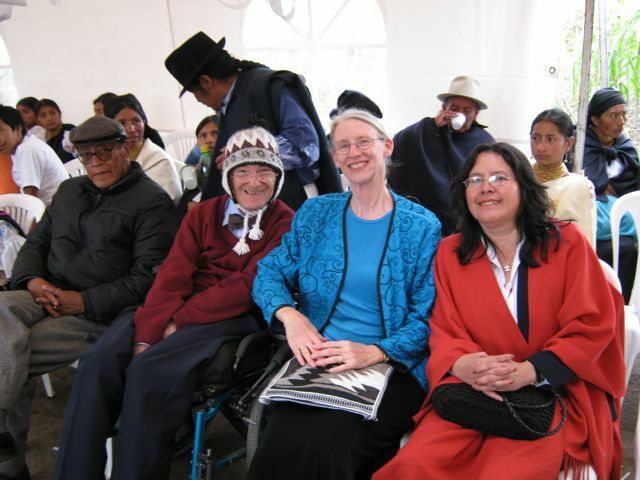 I don’t think many of them see a lot of use in speaking English even though Blanca has told them the advantages of being bi-lingual or, in many cases, tri-lingual (Quechua, Spanish, English). I pray that my interest in teaching them, my reliability in showing up for each class, and my sharing what I can of my language reflects positively on my country and others who speak English. I may never know what effect my efforts have, as I believe is the case for all teachers. At 2:00 p.m. sharp Marcello, Viviana, and David showed up for our trip to Lago Yahuarcocha. 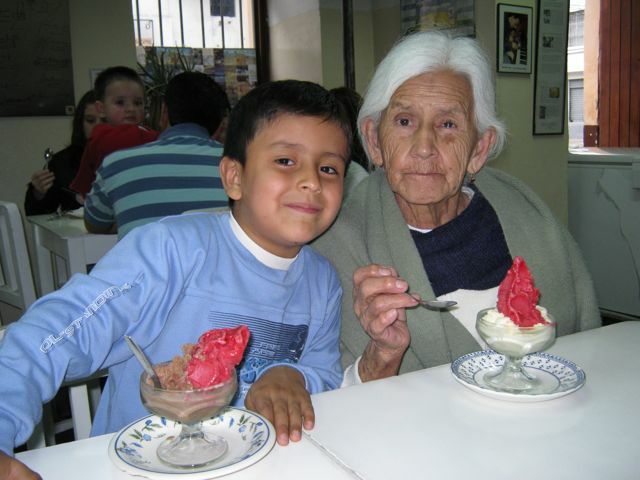 Marcello lived in Belgium for a year and thus treats time differently than a lot of Ecuadorians. We hopped in the car and away we went. The day was beautiful, especially after all the rain we’d been having. The beauty of the lake matched the beauty of the day, with brightly colored paddleboats, tour boats, and different shore birds decorating the slate blue waters encircled by vibrantly green mountains. The paddleboats were not like the utilitarian paddleboats we see so often. These were much bigger, and they were in the shapes of swans, ducks, turtles, and dragons. We even saw a whale. We took a tour boat and had a wonderful ride around the lake. Getting in was quite exciting for me. There was a space in the front a little bigger than my silla de ruedas (wheelchair) and four or five people lifted me (wheelchair and all) up one foot over the gunwale and then down three feet to “my space”. Marcello and David sat on the bow, while Marilyn and Viviana sat in chairs near me. Of course, Marilyn was back and forth between her seat and the bow. The tour around the lake was magnificent. When we got near the shoreline, we could see coots, egrets, and ibises. 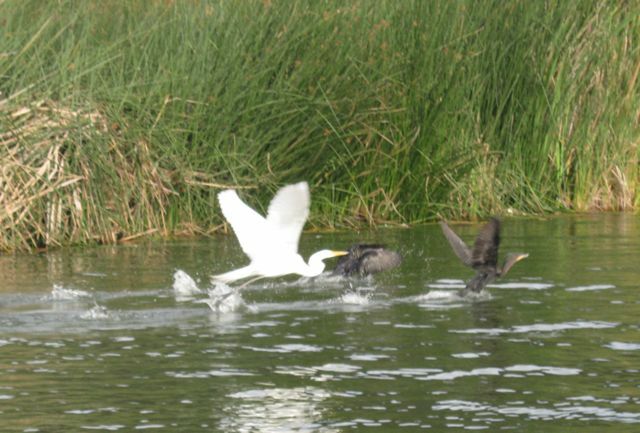 When we were too far away to see water birds, our eyes could wander up the rich green slopes of the mountains. And, of course, when our eyes wandered even further upwards, they were rewarded with a deep blue sky highlighted by fluffy white clouds. After the boat ride, it was time to eat tilapia. We were going to stop at the place where Blanca and Luis took us because we knew it to be safe, but Marcello vetoed that and directed us to a tienda in the pueblo of Yahuarcocha. OK, we didn’t get sick when we ate fish at their house. Guess he knows what he’s doing. The tilapia was great, and so was the company. 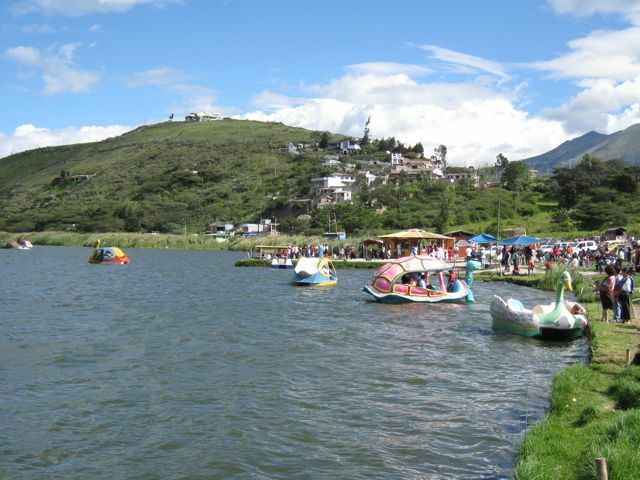 After we ate, we drove around the rest of the lake before doing what we nearly always do when we’re in or near Ibarra – stop at Rosalia Suarez’s for helado (ice cream). Perfect end to a perfect outing. 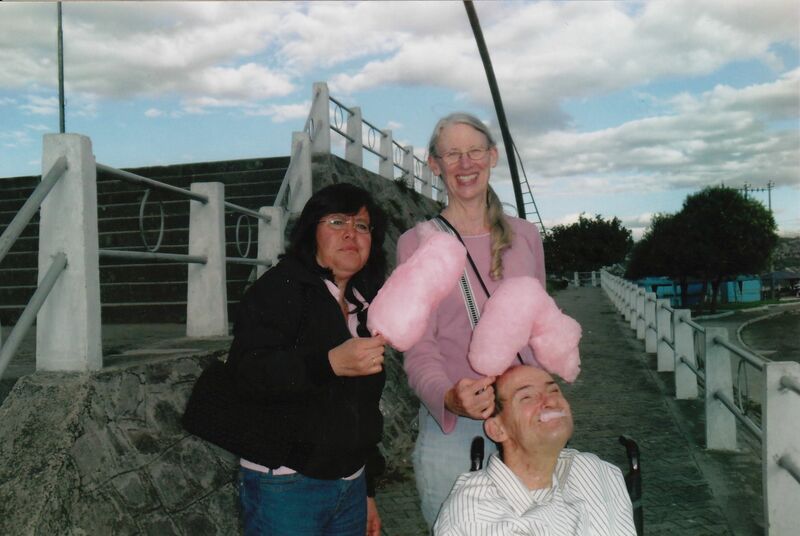 When we returned to Otavalo, Marilyn decided to take our guests home instead of dropping them at the hotel and letting them walk. They kept protesting, and we couldn’t figure out why. Finally, we understood. 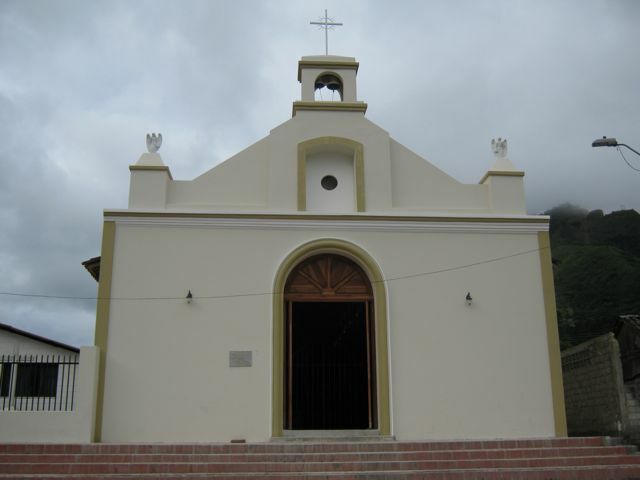 Marcello works in Ibarra. He leaves home early and returns late. This would be the last chance for four-year-old David to play in the área de juegos (playground) with his father on the hotel grounds. Our offered ride home paled by comparison. 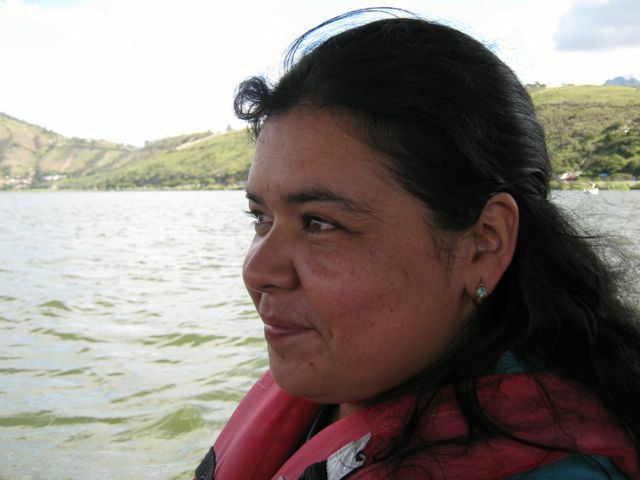 Yesterday, when Marilyn found out she wouldn’t be able to teach class at Huaycopungo today because of a strike in the community, she arranged with Isabel to take the whole family to Lago Yahuarcocha, near Ibarra, at 2:00 p.m. this afternoon. I was a little disappointed we weren’t going somewhere different, especially since we had just been there on Sunday. But it turned out to be the perfect salve for our wounds over having to put Cuatro down. 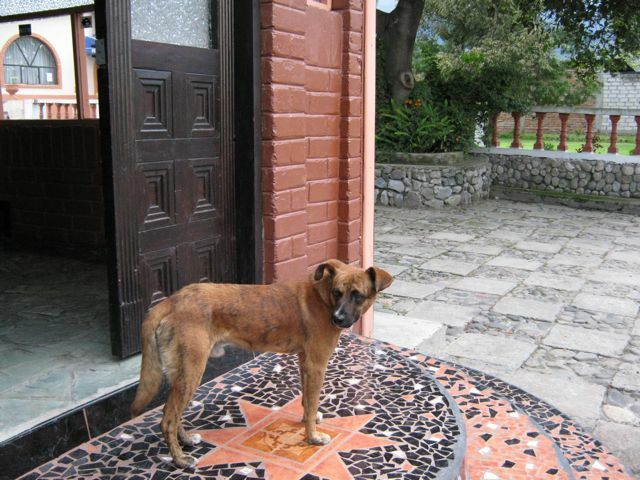 Cuatro was a stray dog Marilyn wanted badly to rescue and place in a nice home. I had her put him down because I felt he was too aggressive and I was afraid he’d bite someone at the hotel. We were a little late leaving, and picked up Isabel, Brayan, and Victoria at about 2:15. 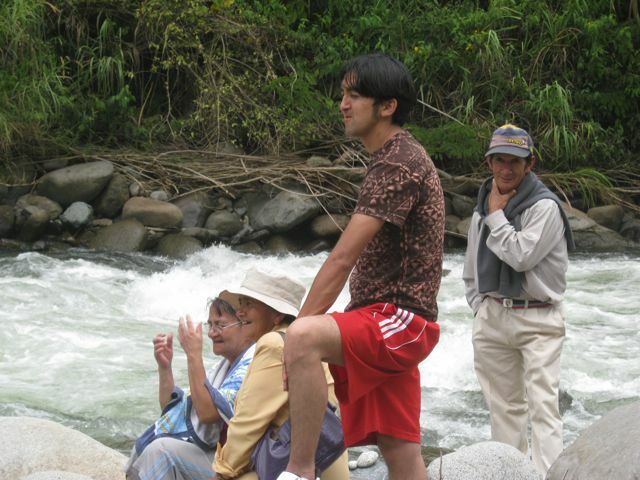 Elvis couldn’t get home from the university in Ibarra in time, so we arranged to meet him there. Not far out of Otavalo, the police directed us off the Pan American highway to a road that would take us part way up Volcán Imbabura to the antigua carreterra (old highway). Groups of indigenous people were protesting a new water law by blocking the main highway to Ibarra. 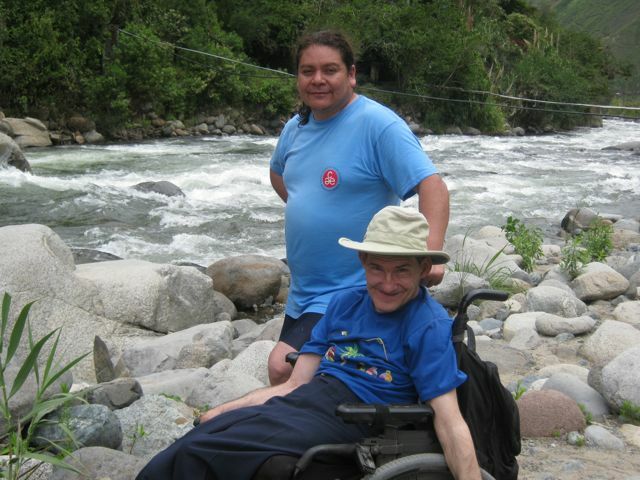 As we traveled along the antigua carreterra, we went around some rocks that were being placed in the road and I vaguely wondered if we’d be able to get back to Otavalo. After a few miles, the police directed us back down to the Pan American highway. 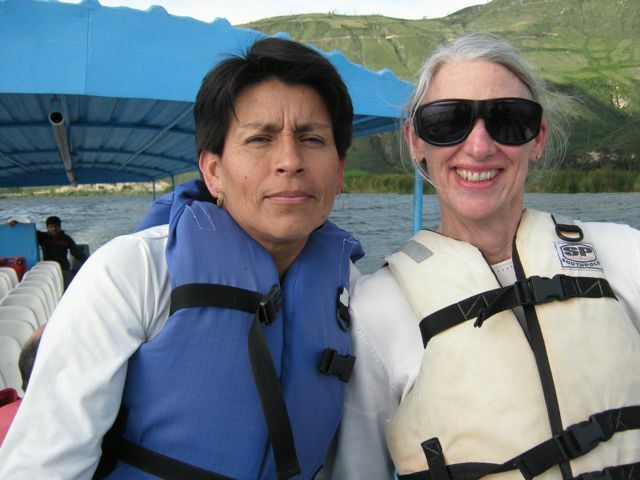 We reached Ibarra without incident, picked up Elvis, and went on to Lago Yahuarcocha. The weather was perfect, but, because most people only go on Sábado y Domingo, the lake’s tour boats were not operating. We both had our hearts set on that, because we had enjoyed it so much on Sunday. Marilyn figured they might take a boat out for six people, so she asked around. Sure enough, there was a person willing to take us. 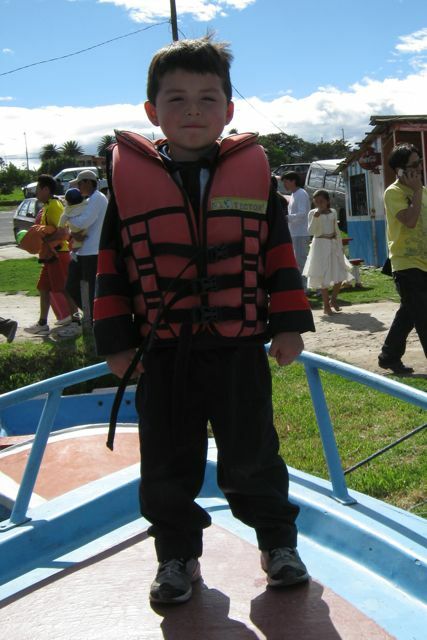 As on Domingo, I was lifted, wheelchair and all, into the boat. Victoria sat in a seat near me, and the rest alternated between the seats and the bow of the boat, sitting mostly in the bow. Isabel’s two sons, of course, stayed in the bow. Because there were far fewer people there than on weekends, we saw more birds – egrets, ducks, ibises, and common gallinas (what I would call common coots). The boat operator also took us nearer the shore than the operator had done on Domingo. Marilyn got some great photos. 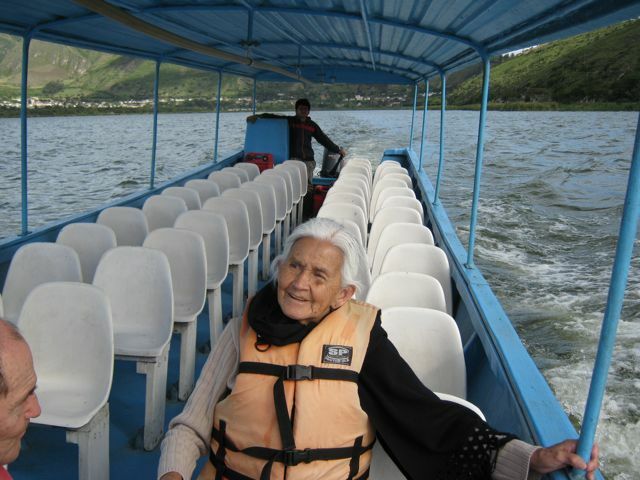 After the boat ride, Marilyn and I were surprised to find that none of the family had ever taken the boat tour at Lago Yahuarcocha. 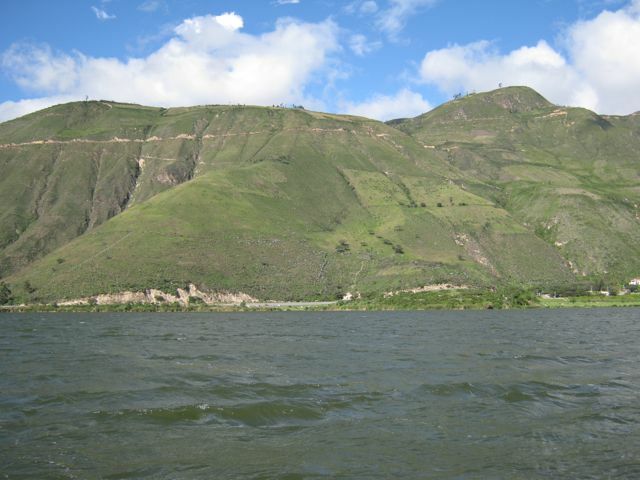 It’s less than 20 miles away from Otavalo, but when you don’t have a car or a lot of resources, even that is out of reach. We then walked along the lakeshore. I was surprised at how far Victoria, who has cancer and is a little frail, was able to walk. When we sensed she was beginning to tire, Marilyn went back and got the car while the rest of us walked on to a place where we could sit. 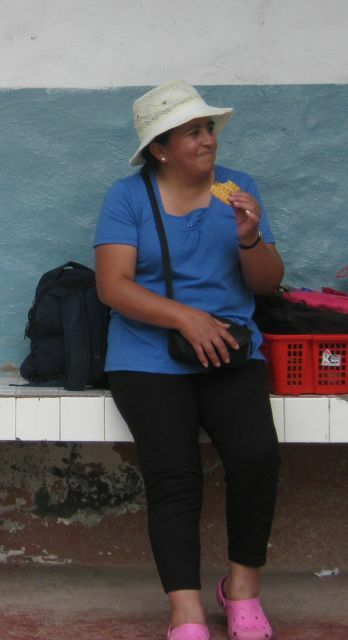 When Marilyn and the car arrived, we drove on to find a tienda where we could eat tilapia. Our first choice, where we had eaten with Blanca y Luis, said they were only open on Sábado y Domingo. So we went to our second choice, where we had eaten on Domingo con Marcello, Viviana, y David. Marilyn and I decided to share a tilapia, and Isabel knew Brayan couldn’t eat a whole one, so we ordered four tilapias among the six of us. They were huge! Marilyn and I barely ate all of ours, and none of the rest were totally consumed. They went home in go-bags. We finished driving around the lake and then headed for our lugar favorito por helados (favorite place for ice cream), Rosalia Suarez in Ibarra, as if we really needed anything more to eat after all that tilapia. Indeed, I had a hard time finishing mine. But, hey, it’s helado! What else could I do? On the way home, we didn’t have to get off the Pan American highway. There were no protestors after dark. But there were rocks lining the road in preparation for blockages the next day. We had been fortunate enough to squeeze through a small window of opportunity to have a fine time, in a fine place, with some fine friends. Once we got back to nuestros habitación (our room), we started thinking about Cuatro again. Sadness descended once more. We went to bed early to try not to think about it. Even though I thought it had been necessary to put Cuatro to sleep, we both felt an acute sense of loss. Now These Are Family Size Packs! I turned the corner and walked another block to find a tienda that made copies. It was busy. While I was waiting, I looked at greeting cards for .75 cents; pencils, pens, erasers, markers, folders, tablets, etc., all of which one can buy in quantities as small as one. The other end of this little tienda had a step up to a glass case with calculators, more notebooks, and school information sheets (like info on names of body parts; info on world history, etc. - I guess students buy these pages of information instead of books). I turned around and stepped down, but on the way down, my head hit the crossbeam and broke a one foot by eight foot mirror that was hung as a decoration. Thank heavens I was not hurt, nor was anyone else, as a triangular dagger shaped piece of the mirror hit the floor. The shopkeeper was downcast. It turns out they had just put up the mirror two months ago, so it was new. She charged me $5 to replace the mirror. I was very apologetic. I don't mean to be so tall that my head hits ceilings in a country where the "normal" height of a person is about a foot shorter than I am. I figured I could afford the $5 more than the owner could and gladly paid. 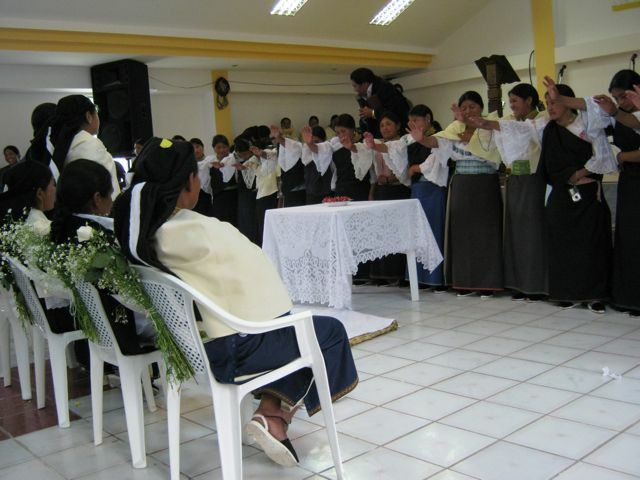 The ceremony was in Quichua, so we didn’t understand a word, but could deduce what was happening most of the time. 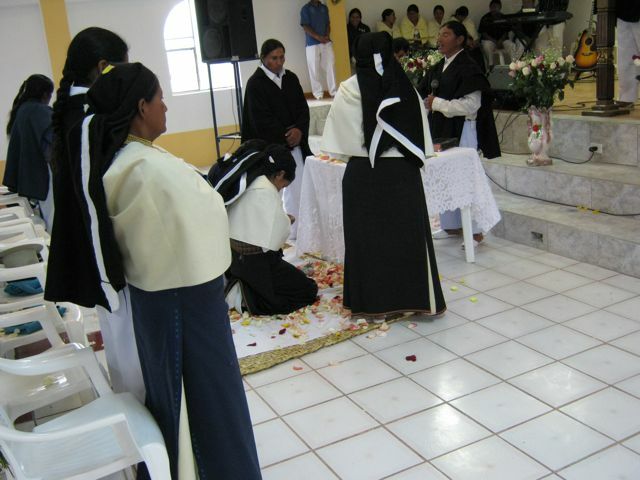 There was a straw mat (representing la cama, or the bed) in front of the altar, which the couple knelt upon during part of the ceremony. As far as I could tell, there were two ministers. The first said several things about la cama - I know that much. Wish I knew what he said. Throughout his portion of the ceremony, he said things that caused people to laugh or snicker. I found it interesting that the entire wedding party never cracked a smile, though. To them, this appeared to be serious business, and so it was. All young women present came and stood at the front of the church. Then the bridal couple stood and the young women bestowed their blessings on the bride. The young men were then summoned to the front of the church and bestowed their blessings upon the groom. At one point, the groom stood on the left, between his parents, with all three facing to the right side of the church, toward the bride and her parents, who were in turn facing the groom and his parents. The bride and groom each embraced their own mother and father and shed tears. I’m sure it was a symbol of leaving one life behind and embarking on another. It was very touching. Families seem closer knit down here than in the U.S. That may be because they don’t generally scatter as far and wide. Next, there was some music, before the second minister took over. He performed the actual nuptials. He didn’t tell any funny anecdotes, like the first minister did. The happy couple (I assume they were happy) and their two attendants gathered around the altar as the wedding was performed. This was when they knelt on the straw mat (la cama) for part of the time. Also, two young girls showered the bridal couple with rose petals at various points. When the “knot was tied”, there was more music and singing. This time it was performed by a women’s group, and was traditional Quichua in nature. After the music, the couple processed out of the church, being showered with rose petals the entire way, and were followed by the rest of us. They didn’t stop at the church entrance and get into a limousine. 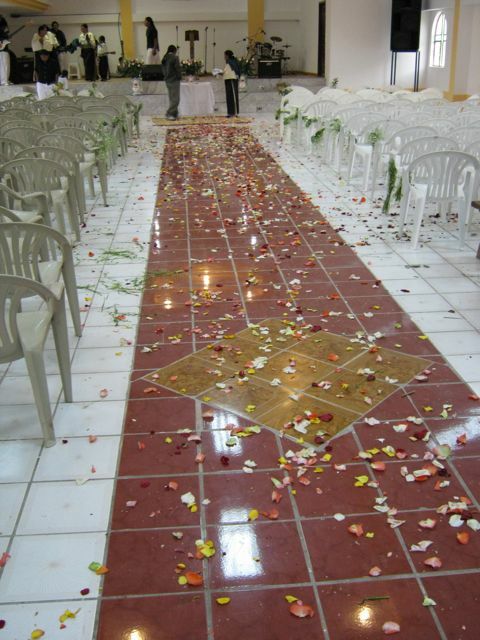 They kept walking, all the way to the home of the novio (groom), where the first part of the reception took place. And they were showered with rose petals the whole way, a distance of at least half a mile. We followed by car a few minutes later and I couldn’t believe how festive the road looked with so many rose petals strewn along its cobblestone and dirt surface. 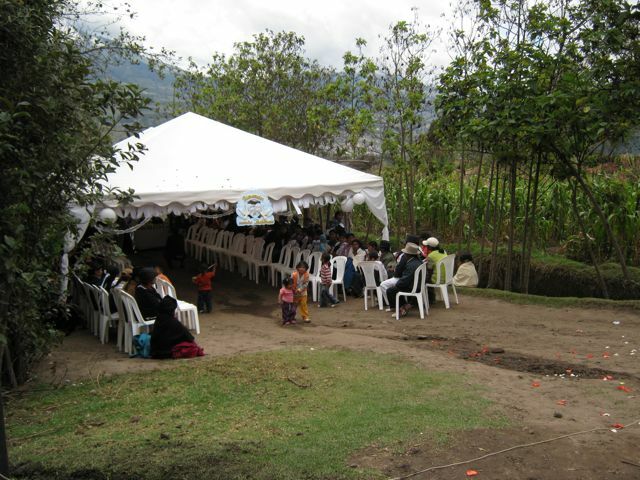 There was a large tent set up next to la casa del novio (actually, his parents’ home), where guests sat, both inside and out. The novio y novia, con sus padres (with their parents), sat at the head of the tent, behind a table that held an enormous cake and many hors d’oeuvres (extremeses) of fruits and vegetables, plus cups of punch. Guests would bring regalos (gifts) to el novio y la novia from time to time. Some regalos were wrapped, and others were not. 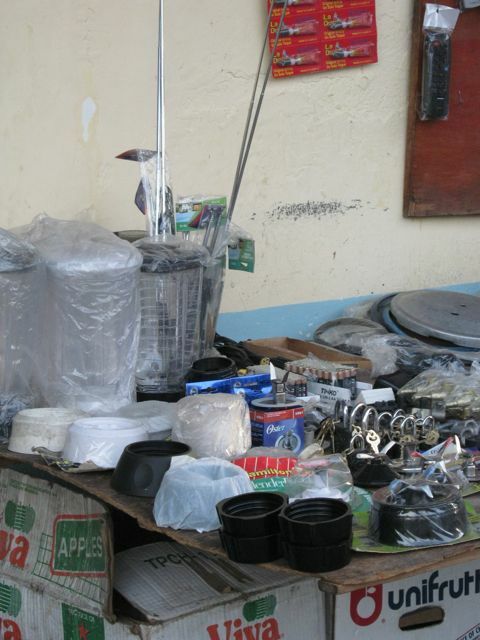 Among those that were not wrapped were many cases of 2-liter bottles of soft drinks, and trays and trays of eggs. 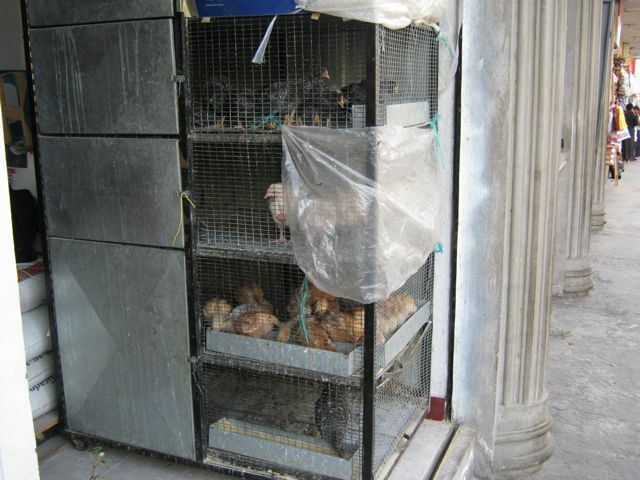 Oh, and we saw a few live chickens carried in by their feet, as well as cooked chickens and guinea pigs. We had never seen those types of wedding gifts in the states and probably never will. We conjectured that part of the foodstuffs that were given were certainly being used for the wedding feast. And a feast it was. I had always heard the term, “wedding feast”, but failed to appreciate its true meaning. First, soup was brought to everyone. The cocina (kitchen) was about 100 yards away from el novio y la novia, so they served the food by forming human chains and passing it from one pair of hands to the next. It was very efficient. After the sopa (soup), came pan (bread). After the pan, came giant dishes of hominy, and a mystery meat that was quite tasty. I figured that was the main course. But I was wrong. Next, there were plates of rice with half a chicken. 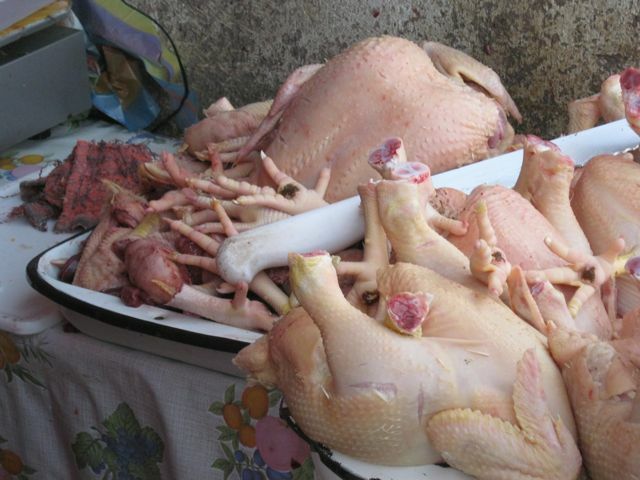 And I do mean half a chicken on each plate. 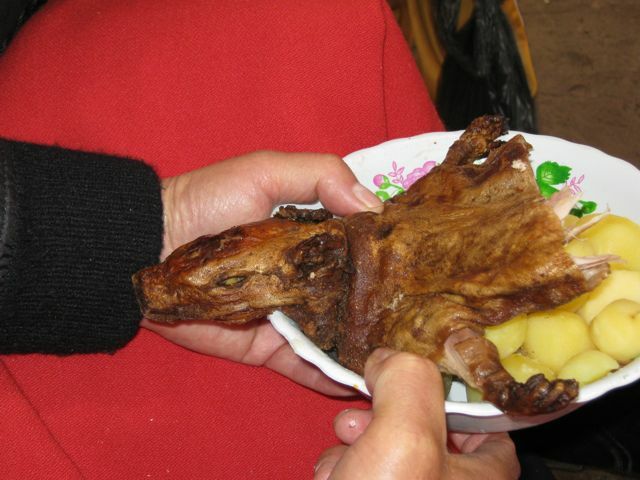 Finally, came the delicacy – plates of papas (potatoes), each with half a roasted guinea pig. 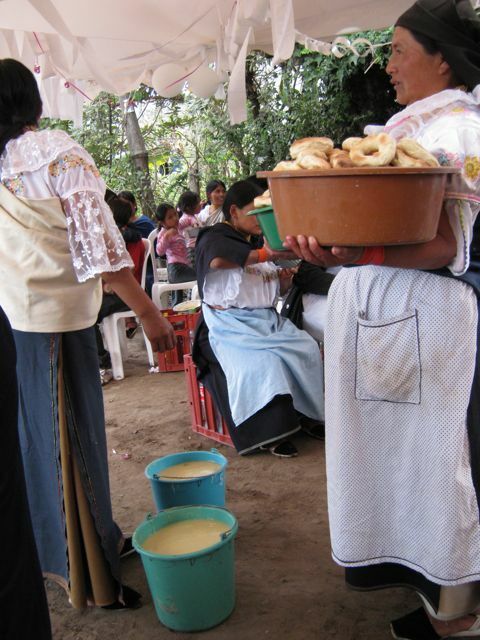 There was also a soupy mixture based on maize (corn). (I think it’s called yamor, because there’s a festival here by that name. Our hotel has festival posters, which depict the corn-based beverage or soup.) The first helpings of the soup were served in individual bowls. If one wanted more, they simply dipped their bowl into any one of a number of buckets of the stuff. They also served soft drinks and some sort of liquor, I think. The way they served the drinks was interesting, too. Someone would come by with a 2-liter bottle (of a soft drink), or a pail (of what I assumed was liquor), and one cup. They would offer a drink. If one didn’t decline, the cup would be filled and its contents had to be drunk before anyone else could partake. I thought this was about as inefficient as the food service was efficient. Of course, it cut down on the plastic cups. People back home would probably gasp at the unsanitary nature of the procedure. We ate most of the food and drank some Coke. Five days later we were not sick. There was music throughout the reception. A group of traditional musicians would play for a while, then they played CDs. They alternated that way throughout the day. We, of course, liked the live musicians better than the CDs. We had to leave about 3:00 p.m. (after five hours), because Blanca, Luis, and Victor had to drive the two hours back to Quito. But the boda wasn’t over by a far cry. The wedding reception was at la casa del novio now, but would shortly be moved to la casa de la novia. There would be more food and more entertainment. I hoped the bridal couple would have a chance to at least walk around. To this point, they had been sitting for three hours. It was raining when we left, and pretty chilly. 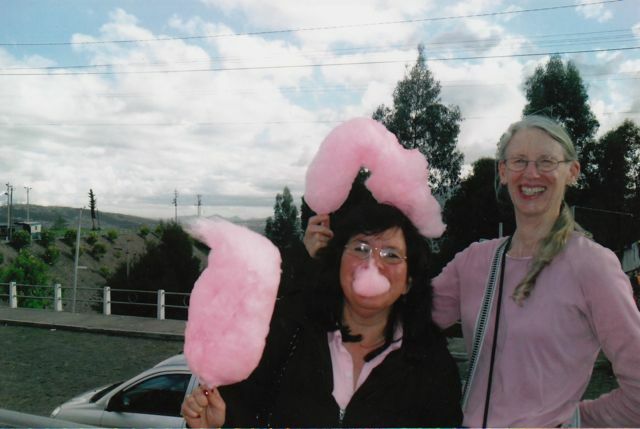 But it was sunny and warm when we got to Otavalo. The distance is no more than 10 miles. But the change in elevation is probably 500 to 1,000 ft. The first part of the video clip we’ve included was taken by accident. We got a new camera just before leaving the states and didn’t have time to experiment with all of its functions. While taking pictures of the band, Marilyn accidentally changed the setting to video. After we figured out why we couldn’t take pictures anymore, we took an intentional video of the inside of the tent. Notice the elaborate pasteles de boda (wedding cake). To my disappointment, it hadn’t been cut after three hours.